Poppy seeds or Khuskhus as it is called in India is an expensive spice and used sparingly, usually in meat dishes. This is one of kind recipe where in Potatoes are simmered in a gravy made entirely with poppy seeds. Its has a very unique taste and hails from the Bengali culture in India. I was introduced to this recipe post my marriage. 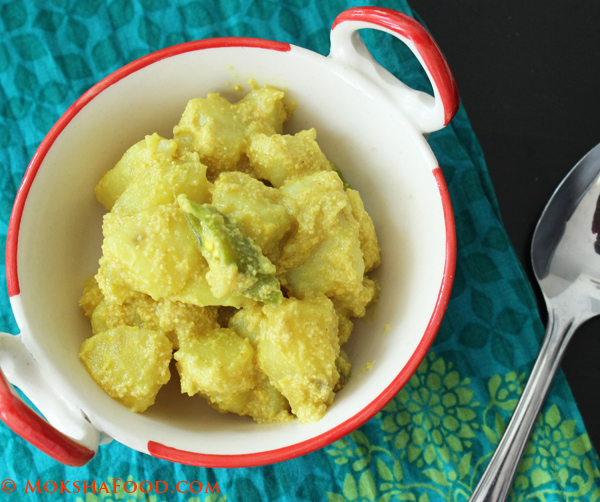 The recipe also calls for the use of mustard oil as the sharp flavor of this oil complements the mellow potatoes very well. You will need to acquire a taste for this dish but once you enjoy it, its very additive. It is usually served along with rice and dal. Soak the poppy seeds in little water and grind to a fine paste. Heat up the mustard oil in a saucepan till smoking hot. This is essential tip when cooking with mustard oil. Reduce the flame. Add in the potatoes with turmeric pdr. Sauté the potatoes for a few mins till they take a nice golden hue but not fully cooked. Add in the poppy seed paste and salt. Sauté well to coat the potatoes with the paste. Drop in the green chilies. Add little water (1/2 cup) and simmer the gravy till the potatoes are fully cooked. 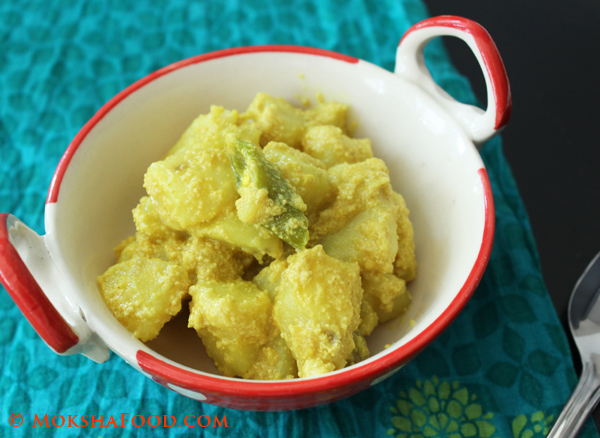 Serve the Alu poshto with another dash of mustard oil on top.